We loved our lunch at the Pour Farm Tavern. We realize that at night, when the restaurant is likely more focused on music or beer, dining may be less of a priority. But on a Sunday afternoon, we were treated to one of the best meals we’ve had in New Bedford. The Big Dog tried a couple of samples eagerly offered by our bartender, Donna, from among approximately one billion beer choices, and ended up with a Green Flash IPA draft ($6). Gina’s cabernet, conversely, was from the Walmart of wine ($5.50) and unremarkable. We started with the falafel salad ($7.95). We received an oversized square plate with a dollop of hummus in one corner, a pile of chopped tomatoes in another, crisp and tasty sliced falafal pieces in a third, and in the fourth corner, the world’s most delicious creamy cucumber and dill dressing. Amid it all were giant hunks of hearty mixed greens, topped with a couple of pita triangles. The Big Dog turned his share into little sandwiches, bravely trying the falafel, which he’s disliked in the past. He liked this version. For lunch, the Big Dog ordered the special whose announcement on a sidewalk sandwich board drew us there in the first place: a lobster BLT ($15.95). Framed within grilled sourdough bread, topped with artisanal greens, the yummy sandwich came with sweet potato fries. Gina turned to the regular menu and selected the BBQ Sampler (a steal at $15). 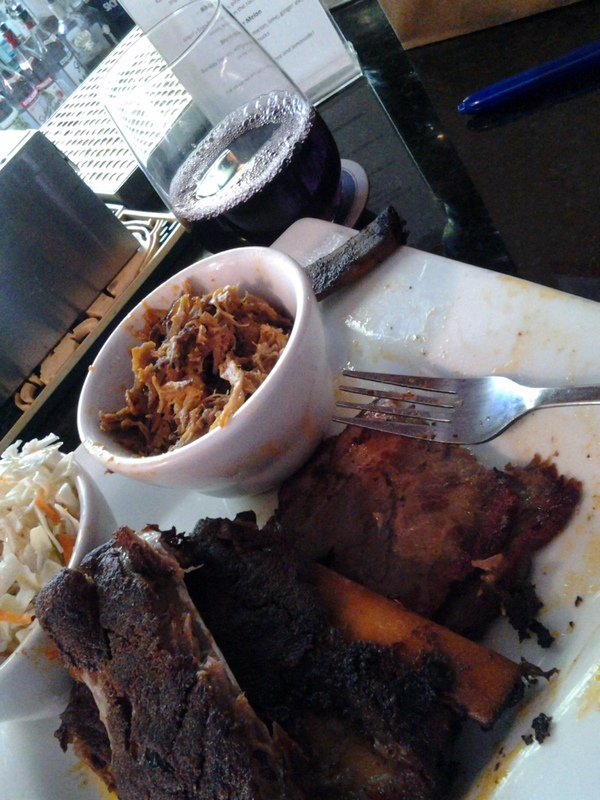 It included a half rack of baby back ribs, a little bowl of pulled pork, slabs of beef brisket, and tasty cole slaw. Remnants of the huge portion was just as delicious the next day. During our Sunday afternoon visit, the small but eclectic crowd that included a fisherman, a college student with her parents, and a handful of 20-somethings, was charmed by or servers’ equally eclectic jukebox selections, recorded long before anyone but Gina and the Dog were born. The Pour Farm Tavern includes an outdoor dining area in a spacious and shady alley. Inside, the decor is definitely 1970s Dorm Room, right down to the Led Zeppelin posters and vaguely foreign flags. We’re pretty sure no one goes there for the decor, and we suspect that few go for the food. But that’s a mistake — the food is delicious, and you’re certain to enjoy it. We had the good fortune of returning with friends to the Pilot House, and it was the kind of dinner where time flies by and next thing you know, it’s time to go home. Joining us was a crew of four people we like a lot. You know the drill: one minute you’re seated in a fairly crowded restaurant, and the next minute the waitstaff is scowling at you from a huddle in the corner, calling their boyfriends to say they’ll be late because a party of six just won’t leave. It wasn’t that bad, but it was well on its way, on this Saturday night before the summer season makes it so difficult to find a seat at a really good restaurant on the Cape. And the Pilot House is a really good restaurant. We had one service misstep and one dish described only as “good,” but our dining experience was otherwise excellent. 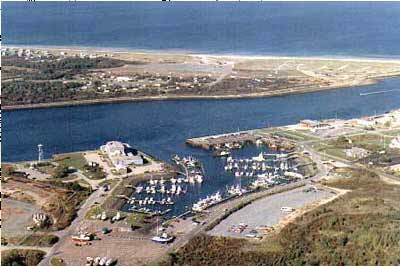 The Pilot House overlooks the Sandwich Marina near the eastern end of the Cape Cod Canal. One of many window seats at what may have been a wrap-around deck would have offered a great view of the waterfront, but we were seated by the fireplace, unlit during this first warm evening of the year. It’s probably a nice spot there on a winter evening, but due to the restaurant’s spare and airy decor, colorful in a classic way, it was a nice spot in the spring too. The restaurant’s design makes great use of varying levels, with the bar at the entrance at the highest point, and dining levels stepping down towards the sea. The menu includes a varied selection of wines by the glass. We’ll spare you Gina’s anguish at the news that a new list is being introduced and the Albarino is being phased out (who phases out an Albarino in May!?) — but she was placated with a floral Chateau Ste. Michelle sauvignon blanc ($6). The Big Dog spotted a Josh cabernet ($9) and jumped right in. Jim ordered a Harpoon IPA ($5), which we all know is the perfect antidote to a day of yard work, and Mary the fruity Pilots Punch ($9). Dark and Stormy each ordered their namesake beverage ($9). As an appetizer, Gina ordered the green salad ($3.95) with balsamic vinaigrette served on the side without asking. The salad consisted of mixed green leaves, with a couple of slices of English cucumber and a couple of grape tomatoes. Sounds boring, perhaps, but the combination of a snappy dressing and fresh, clean, spicy greens was spectacular. A flawless green salad portends a meal characterized by obsessive attention to detail. Jim ordered a cup of the Portuguese kale soup, the day’s soup ($4.95). Anyone dining regularly in the Southcoast region of Massachusetts knows that kale soup tells you as much about a kitchen as a green salad does, and this didn’t disappoint: Jim said it was hot, both in temperature and spice. Mary ordered a half dozen raw Duxbury oysters ($13.50) while the rest of us looked on in horror, having recently enjoyed endless oyster dishes during the Wareham Oyster Festival. The Duxburys were on the specials menu, as were Barnstable oysters provided by our friends at Big Rock Oyster. The Big Dog ordered a caesar salad with anchovies ($6.95), and this is where the unfortunate service misstep occurred. As his entree, he ordered a monstrosity called the Seafood Pot ($17.95) off the appetizer menu, and it was hauled out as his appetizer. So while the rest of the table sat with its tiny soup cups and delicate salads and wee shellfish appetizers, the Dog confronted a giant trough containing lobster, shrimp, oysters, clams, mussels, all in a delicious sauce with bread for dipping. Good, but it threw off the cadence of the dinner in a way that the staff should have anticipated. As an entree, Dark and Stormy each ordered the seafood special: lobster ravioli generously adorned with lobster, scallops, shrimp, tomatoes, and asparagus ($26.99) in a white wine sauce. We all tried some and agreed that lobster ravioli is so often marred by a heavy sauce, but this was not. Mary is a connoisseur of fish tacos and was pleased but not particularly impressed by the Pilot House version ($19.95), which included black beans and was made with mahi mahi. Jim’s dish of mussels marinara ($19.95), were pronounced very tasty. They arrived as an enormous mound of relatively small shells concealing a plate of pasta in a sauce worth sopping up with the bread that came alongside. Gina was pleasantly surprised by her baked scallops ($21,95), a dish that many restaurants badly mangle. A small plate of a dozen or so large day boat scallops, with crunchy crumb topping, were nestled into a delicious sherry butter sauce, and came with rice and crunchy green beans. The scallops were perfectly done, moist inside but cooked through. We were kidding, in the beginning, about the waitstaff calling their boyfriends. The team at the Pilot House is professional and pleasant, and at one point a passing staffer alerted us that the Bruins were winning in a playoff game that we could not see from our vantage point. Gina and the Big Dog enjoyed this spot in a different way when stopping in recently for an afternoon snack and beverage at the bar. It was evident during that stop that the Pilot House is the sort of dependable yet adventuresome restaurant where you go with people who are important to you. We did that, and we were not disappointed. A while back, we dined with some friends at a spot on MacArthur Boulevard called Cranberry’s Restaurant. 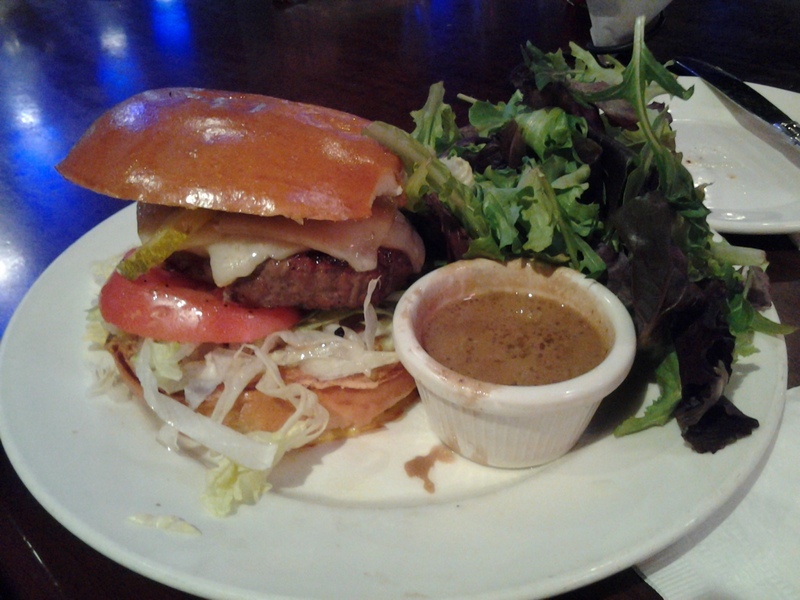 As you can see from our review, posted here, we were kind of surprised by the casual atmosphere and service, and thought we would be less confused if we wore jeans and hoodies and sat at the bar, then called The Bog Pub. So, here we are, wearing sweatshirts and Levis, and we’re still a little confused. The bar is still called The Bog Pub, but apparently so is the restaurant. Nowadays, the whole place offers six entrees and a special, and the rest of the menu consists of interesting sandwiches, soups and salads, and a section called “small plates.” The price and complexity of these items makes them sound like tapas, but our server read us two specials and called them “appetizers.” Turns out that the “small plates” are quite large, but the portions on them are very small. That’s not to say you’ll stop at Burger King on your way home, but you definitely won’t go waddling out with a doggie bag, either. We hate to sound school-marmish about the language, but after a while, the occasional imprecise slip-up becomes a consistent theme. Okay, rant concluded. Now for the review: Get what we got, and you’ll be pretty happy with The Bog Pub, or whatever it’s called. A tapas approach, with two small plates apiece, would be a filling meal of high quality and an excellent value by any measure. The relatively diverse wine list included something we never see in these parts: wine on tap, which bartender Courtney said keeps the wine fresher. Gina chose a Pacific Cabernet ($8), and not only was it darned good, but it was the least expensive offering. The Big Dog got a Lehman Shiraz ($9). 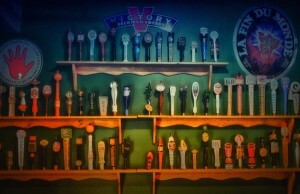 We liked our selections enough that we didn’t wish we’d tried flights, three 3-ounce pours available for $12. After a long day, we only had the energy to share two small plates. Gina’s pick was the pan seared duck livers ($9, shown in the terrible photo above). It was served on a bed of creamy polenta with a moat of “smoked gravy.” “Tastes smoky!” observed the Big Dog. 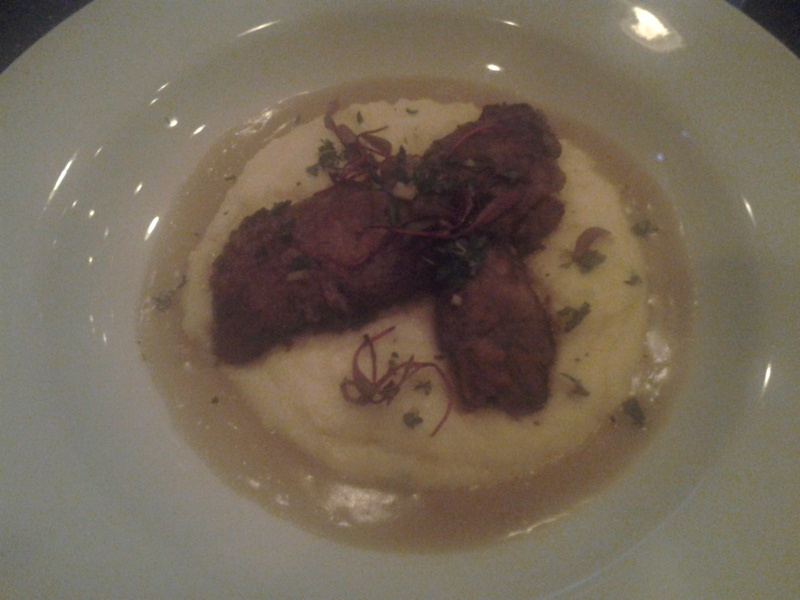 The livers were crisp and flavorful, the polenta rich, and the tangle of microgreens intriguing. It was one of the most delicious dishes we’ve gotten in recent months. The Big Dog selected cod croquettes. In retrospect, we were both probably expecting something like codfish cakes, leaden and squishy. Instead, we got a plate of fishy little poufs, crisp on the outside and moist on the inside, and yummy with the remoulade dipping sauce. British Beer Company is a “chain” of 13 pubs, mostly in southeastern Massachusetts, that seeks to replicate the experience provided by a small town pub in Great Britain. We have no first-hand experience with the original concept, but a countryside dotted with BBCs seems like a pretty good idea. We got a look at two of BBCs restaurants on one recent night, and they’re both pleasantly warm and inviting, with decor that emphasizes rough-hewn wood… and beer. BBC offers a very large selection of draft beers, ranging from the industrial brewery Kings of Beers that people inexplicably like so much, to obscure craft brews, including the IPA from our friends nearby at Mayflower Brewing. We stopped first at the BBC in Manomet, a neighborhood in south Plymouth, on a Sunday night, hoping for a seat at the bar to watch the Brooklyn Nets with Paul Pierce and Kevin Garnet in their ultimately triumphant return to the Boston Celtics’ storied parquet floor. The bar was full and the TVs were tuned to some obscure Atlantic 10 college basketball re-run. Fortunately, there’s another BBC right down the road, so we moved on. Being on the Cape Cod side of the Canal, the BBC in Sandwich is far more mellow in the winter than it likely is during the summer, and probably more mellow than Plymouth is year-round. We easily found a spot at the bar, whose only other occupants were a young couple on a first date, which we surmised because the woman’s unbearably annoying laugh would likely preclude a second encounter. Our pleasant but brisk bartender, Sunny, offered us a taste of some fancy cabernet, but Gina opted instead for the house (Avalon, $7), in part because the sample was overpowered by the odor of chlorine in the glass. The Big Dog spotted one of those little spoons that signifies the possibility of a black and tan, and got a muddled version ($6.50). We started with an order of Andouille Scotch Eggs ($8.99). We’d never had any Scotch eggs before, and the basic premise, involving soft-boiled eggs baked in a crust, made Gina squeamish. But these were outstanding. The Andouille sausage made for a flavorful coating, the eggs were lightly cooked but not runny, and the presentation was nice. 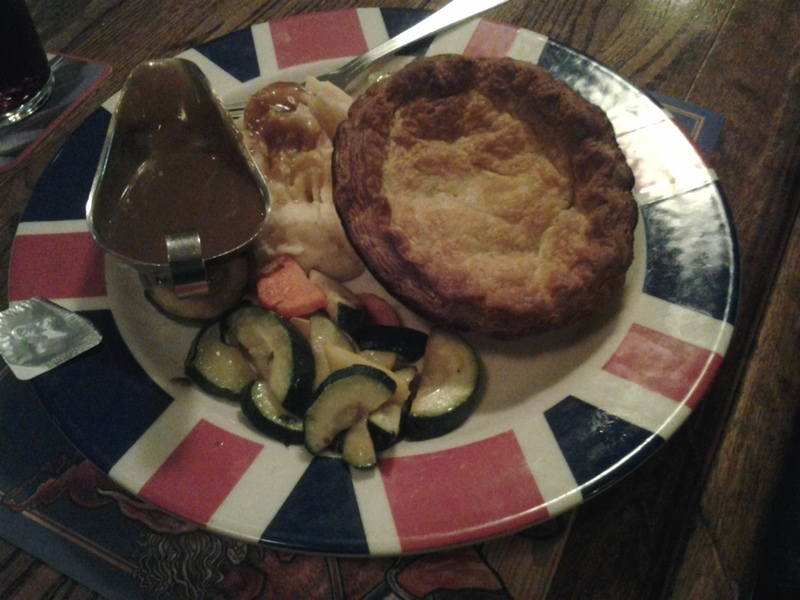 The Big Dog ordered a steak and ale pie ($13.99, pictured above) as his entree. It came with a sauteed zucchini and carrot medley that was delicious unless you have an irrational dislike for green summer squash, and mashed potatoes. The crust was heavy and the Dog characterized the gravy inside the pie as “overbearing,” and the steak inside was overcooked. But we’re both Irish enough to know that this is probably just how people in the Old Country like it. 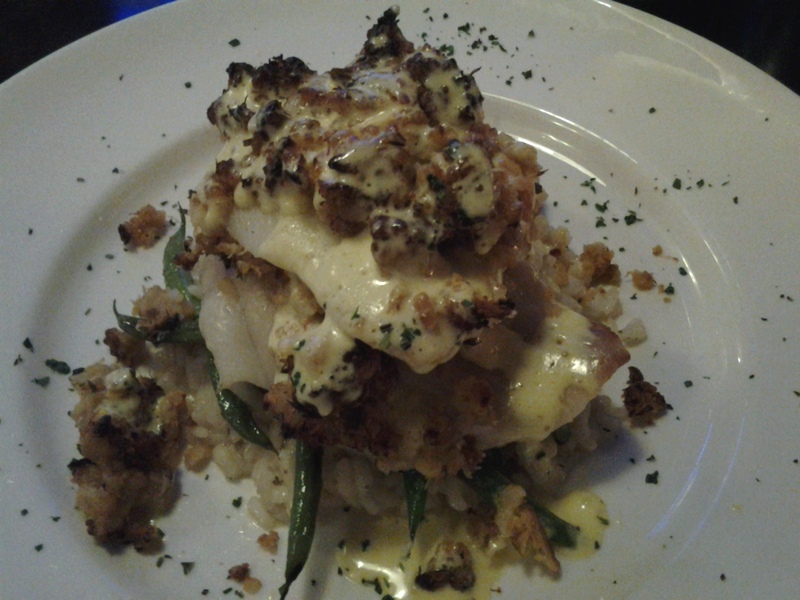 Gina ordered a mahi mahi dish ($16.99) off the full page of “gluten friendly” offerings. While the dish was delicious — moist fish topped with a piquant mango pico, with jasmine rice and approximately seven green beans — the order was apparently so confusing that the kitchen cooked something else entirely then discarded it before starting in on the proper order. We didn’t take note of the time and weren’t in a hurry, but the result was definitely a complimentary-dessert-grade delay, if not handwringing apology from the manager. Here, nothing. There was enough positive about our visit to the British Beer Company to ensure our return, not just to Sandwich but also to Plymouth. The prices were very reasonable, portions large, food pretty good, and the atmosphere was comfortable. Maybe we just need to recalibrate our expectations before we go. We hardly ever dine at the standard times. The Big Dog is usually working at what others would consider lunch and dinner time, and it just seems weird to be in from the sunshine at noon. The downside to our approach is that we don’t necessarily observe how the waitstaff handles a busy room, and in the case of the Inn on Shipyard Park, our midafternoon lunch/dinner meant we probably missed a rollicking crowd. But what we got was the full attention of Tom, the pleasant bartender, and the skilled kitchen. You may remember the Inn on Shipyard Park as the Kinsale Inn, an old-timey pub in Mattapoisett’s quaint downtown overlooking the charming Mattapoisett Harbor. They describe themselves as “the oldest seaside inn in the nation,” but the fact is, when you’re deep inside this rustic restaurant, you might as well be in Scottsdale for all the seaside you see. But so what. We sat at the bar and watched ESPN, and had one of the best late lunches we’ve enjoyed in a long time. We started with lobster egg rolls ($12). There was the expected kvetching about what the menu called “fresh curry mango chutney” but which tasted like mayonnaise mixed with pineapple juice. We didn’t really care, because the egg rolls were so delicious on their own — crunchy on the outside and meltingly moist on the inside. We think the stuffing was simply cooked julienned carrots and cabbage with enough lobster to get some in every sumptuous bite, without an overwhelming lobster flavor. With the egg rolls behind us and full glasses of Mayflower Seasonal (Spring Hops) and 14 Hands Cabernet, debate ensued. This is not a good menu for those who find decision-making difficult. Through one half-hour segment of SportsCenter, we came up with dozens of appealing combinations, but finally settled on a cobb salad ($12) for her, and “savory meatloaf” ($11) for him, the latter because of a promise of green beans which never materialized. In their place was a heavenly melange of flavorful summer squashes and red peppers. The meatloaf was mousselike in its lightness, grounded with dollops of gravy. A hearty scoop of mashed potatoes shared the gravy and a dusting of flavorful dried herbs, maybe parsley. 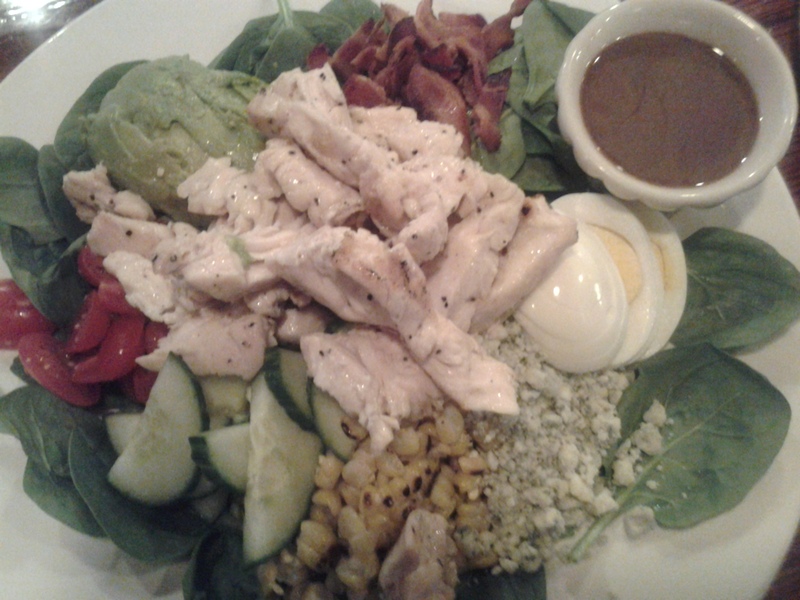 The cobb salad was simply the best we’ve had. The base was spinach. The toppings included a half avocado, a hard-boiled egg, grilled corn that was a tad spongy in April, nearly half a cup of bacon hunks, some bleu cheese, and halved cherry tomatoes. The garnish was a generous serving of grilled chicken slices. This was the kind of salad that makes one wonder why one can’t lose any weight. In fact, there was so much that we brought half the salad home for our “Dog House” dinner. In all, The Inn is somewhere that we will frequent throughout this next summer season. Looking forward to sharing the experience with friends who we know will enjoy it as we did. Put your flaps up and landing gear down for final approach to this fine restaurant located, appropriately, at the New Bedford Airport. From the air, the Grille may look romantic or welcoming, but arriving by land, we entered through a winding industrial park road and walked through a formica-clad airport waiting room. The contrast made the sleek restaurant decor seem even snazzier than it is. Cape Air provides passenger service at New Bedford, and the Airport Grille certainly approaches island standards for those stopping in for a snack before their 50-minute flight to Nantucket. For our earthbound excursion, we were joined by Estelle and Rupert, who were sipping espresso martinis when we arrived. 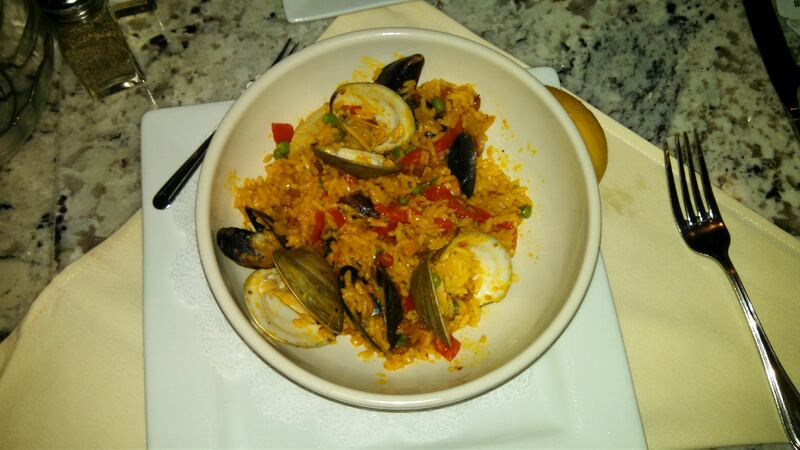 We began with an order of PEI mussels in a traditional preparation of white wine and butter ($10). 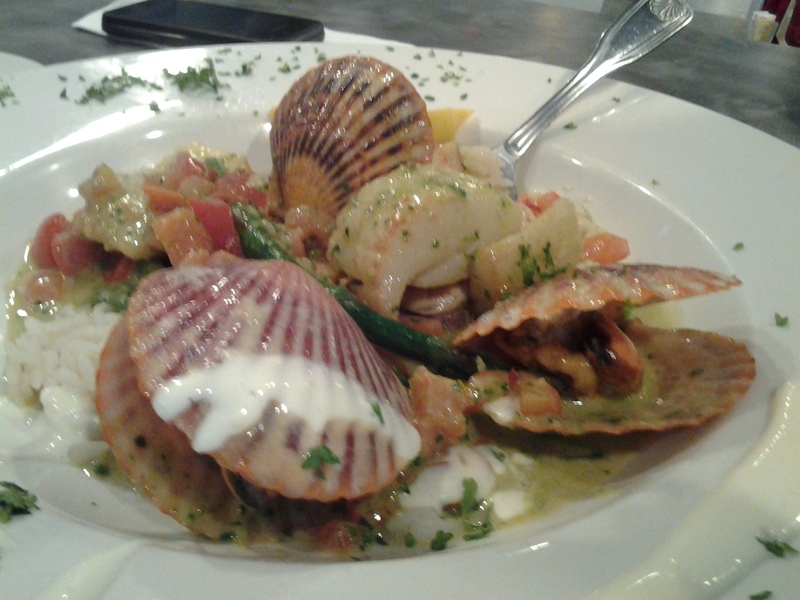 The dish was also available with littlenecks, and could be prepared Portuguese style, or diavolo. This was a great choice and should have guided the rest of our evening: when in New Bedford, even in a landlocked industrial park, eat fish. The Big Dog and Rupert each ordered a salad which the ladies sampled. Dog’s “local greens” ($6) was crisp and fresh in a lightly applied balsamic vinaigrette. Rupert’s wedge salad ($7) looked pretty good, despite slices of wan, wintry tomatoes, but Estelle said the creamy dressing was oppressive. Estelle selected a pappardelle bolognese ($15) whose lightly applied sauce had a nice tang to it. The Big Dog ordered a sirloin steak ($26) and regretted it because of that whole fish thing. The steak cut was gristly, the asparagus tasty but nothing spectacular, and even the bernaise sauce was weak. Rupert ordered salmon ($18). It came with couscous and broccoli rabe and a piquant sauce, and was excellent. The very fresh and hearty cut of salmon was perfectly prepared and complimented by the yummy sauce. With our entrees, we shared a bottle of Bazan malbec ($30) which we all enjoyed. To conclude, we shared a creme brulee, because it turns out that Estelle also adheres to Gina’s rule that if creme brulee appears on the menu, you have to order it, because it’s invariably delicious, and it’s not like you’re going to make it at home. It was topped with a kind of a sad-looking strawberry. Before taking off, we poked around the restaurant, which was quiet for a Saturday, and found a lovely lounge where comfy leather chairs were arrayed around a gas fireplace. We’re guessing that the sunset, as well as the display of air traffic in the summer season, would be pretty spectacular. But the food was great too, and that’s a rare combination. You are currently browsing the archives for the Good Wine/Beer Selection category.